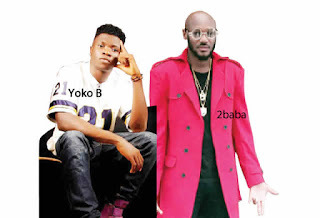 An up and coming artiste, Analike Okezie (Yoko B), has accused popular singer, 2 baba (formerly known as 2 face Idibia) of stealing his song, Amaka. Recall that 2 baba recently released a song titled, Amaka. On the track, the singer sang about a certain Amaka who disappointed him after promising him that she would come to his house. On the song featuring DMW's Peruzzi, the singer narrated how he had made arrangements such as buying diesel and alcohol, only for the girl to fail to turn up. Meanwhile, in Yoko B's version, the singer also sang about how Amaka broke his heart after she claimed to love him. The beat of the two songs also sound similar. In an interview, Yoko B said, "Right now, I am fed up with some of the top artistes in this country. Once they are up there, they can never help you grow. They prefer to rip you off and frustrate your hustle. The new song, Amaka, by 2 baba featuring Peruzzi is my concept. The song was produced by Richie, who also did the chorus of the song. Shortly after producing my song, Richie was employed by Larry Gaga and he left FESTAC Town for Lekki where he worked with 2 baba. My songs were still on his computer at that point. I was shocked when I discovered that they had stolen the title, concept and message of my song. I released my version about five months ago and I have been trying to promote it with the little resources I have. However, when contacted, Richie, a person who claimed to be his manager answered the call and threatened our correspondent not to publish the story. He said, "The guy (Yoko B) is just looking for cheap fame.